Today was a pretty good day in class. I’m still really disappointed in how my pieces came out, and the morning started with assembling the last of my coasters (they may be frisbees, in point of fact). But it was good practice, and Patrick had lots of interesting stories and great advice on how to do marquetry. The first was around how to organize your work. 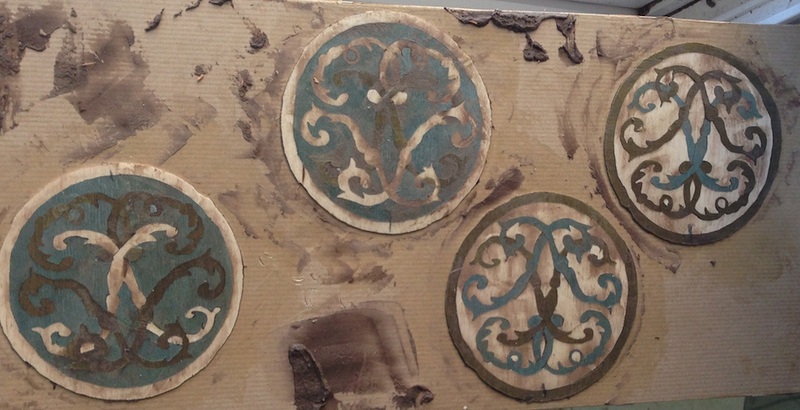 For this simple set of six coasters, about 4″ in diameter, there were 162 parts total. I had slightly more than that because I broke a few. I lost a few too, so maybe it was a wash. His advice was pragmatic. First, handle each piece as few times as possible. As you take a plug out of the packet, immediately throw away the backer, grease paper and any layers that aren’t part of the actual project. Then arrange the parts in an exploded view in the correct relationship to each other as they will go into the final assembly. In the case of the coasters we positioned the parts face side down, so it’s a mirror image of the goal, and the inverse of how they came out of the packet. 162 pieces for six coasters, no wonder my head hurts. This layout is essential for assembling the project onto the kraft paper. You smear a bit of hide glue onto the area, and you have maybe 4 or 5 minutes max before the glue cools/dries too much for assembly. After that you need to add little bits of glue as you go, and it’s gets progressively more messy. There aren’t many things more fun that trying to handle little delicate bits of veneer with sticky fingers. Root canals, maybe. Another useful trick is making a pattern to either repair veneer or in this case, to replace a missing part. Remember the missing parts? A couple were little dots about 1/8″ in diameter, those I just cut from a scrap with a tiny gouge. One piece had broken off the background and gone on walkabout. I’ll probably find in glued to the bottom of my sneakers tomorrow. The repair technique is to use a bit of thermal printer paper, like from an office adding machine. Hold it over the cavity and rub it with a burnisher. It will pick up the outline of the opening. Now trace around the outline on the paper to define the cut line, glue it onto a piece of veneer (in this case I used the outside scrap from my pack) and cut it out. Once I cut the plug from my pack I picked out the veneer color I needed and glued it into the hole in the coaster. This has a bit of paper on it as all of the colored veneers for this project were first laminated with newsprint to help keep them together. Since this is the back of the project it doesn’t matter, but I probably should have reversed my pattern (or glued it to the other side of the packet) to avoid this. 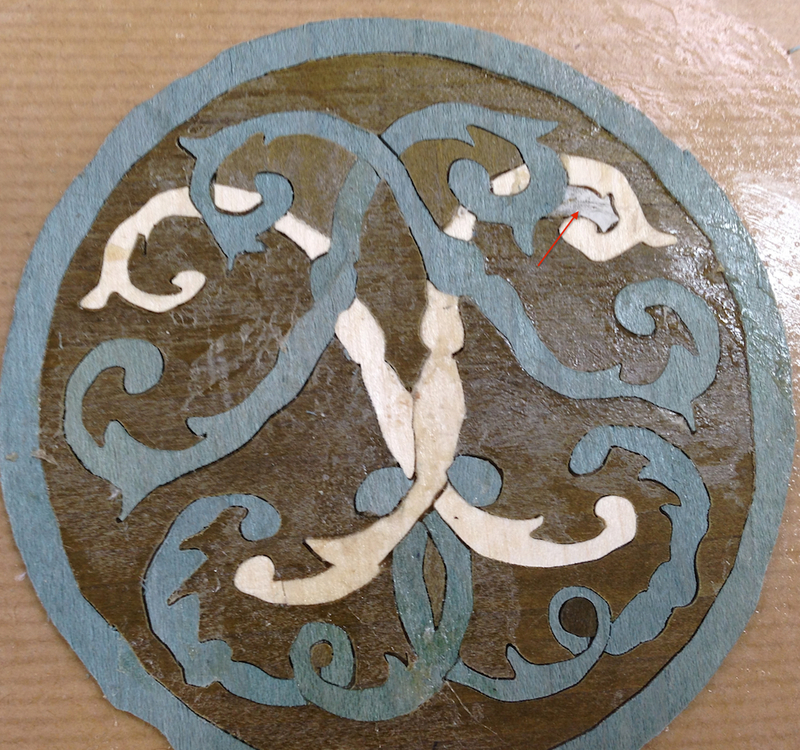 Coaster repaired, this is prior to adding mastic to fill the saw kerfs. This picture shows off my sloppy saw work, that was a major disappointment for me. But, I’m sure it’s something I can improve on with practice. From three or four feet away (assuming you have bad eyesight) the frisbees coasters don’t look horrible. It’s like that old saw – looking good from afar, but far from good looking. Same drill as yesterday, mix and apply the mastic, working it into the saw kerfs, then scrape off any excess. After it cured for an hour we scuff sanded with 80 grit to remove any lumps and cut the discs free. This afternoon Patrice demonstrated French Polishing, although of course they don’t call it that in France where he’s from. It’s just called “polishing with a pad”. That’s a process for another day. Patrick also did an excellent lecture on a technique that is a variation of Boulle marquetry called “painting in wood”. The key to painting in wood is that instead of each layer in the packet being a different veneer, a layer may have two or three colors pieced together, with the grain aligned to suit the picture. This makes more efficient use of materials than standard Boulle. 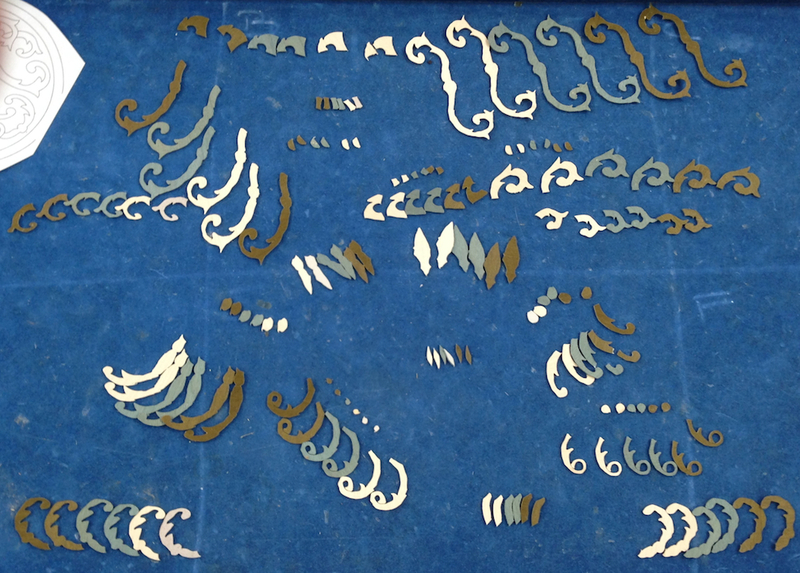 The alternative, piece-by-piece, requires hyper-accurate cutting as each piece is cut independently from the others. First, next time I take a class I’m leaving my sell phone in the trunk so I can’t possibly get calls from work. 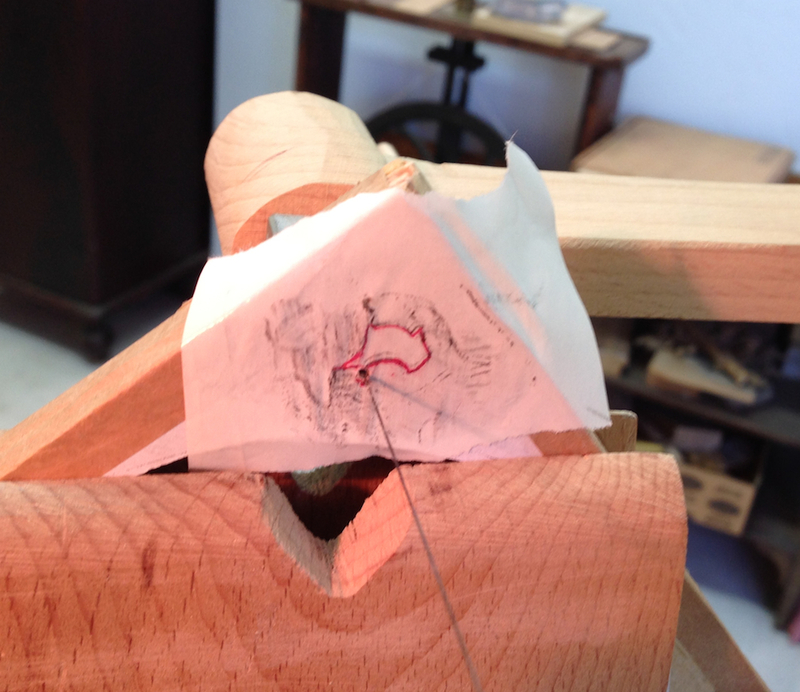 The class provided lots of seat time learning how to saw marquetry packets on a Chevalet. I knew that going in. It also provided in-depth instruction in mixing and using hot hide glue, applying french polish and designing marquetry projects, from the drawings through assembling the packet and keeping track of the parts. I think the self portrait I did actually came out nice, we laminated that onto a piece of plywood yesterday and removed the kraft paper today. I’ll put some finish on them when I get home, I’m happy with that one. The other two projects with the crazy curly-Qs I’m officially calling for a do-over. I’m going to build a Chevalet when I get home and re-do the coasters. Maybe the square project too, but at least the coasters because everyone needs a nice set of marquetry coasters, right? Mastic squeezed into the saw kerfs, this gets scuff sanded and then cut loose from the paper backing. Good luck with this Joe. I would not mind making the chevalet but using it ain’t happening with me. There are some aspects of woodworking that I don’t want to learn and this is one of them. I agree with periodcraftsmen – you’re being too hard on yourself. For a first attempt I think that the coasters look good. I think you did great. There are a lot of new skills involved in this type of work. The chevalet alone seems like it would take quite a while to get a feel for and use proficiently. I admire this type of work. It’s beautiful, but way beyond my patience quotient. I can picture myself chasing little pieces all over my shop floor. There is no doubt in my mind that you will own this skill in a short time and will be churning out some stunning examples of marquetry. Thank you for taking the time to share your journey. Congratulations on completing the first leg of your journey into French marquetry! Your projects look quite good to me and when finished up, they will amaze you. After you have set them aside for a short while, that is. I agree heartily with leaving any distractions behind. other wise you are not really on vacation. Companies today are less than sensitive when handling personal situations. I can testify having worked for a company that used to have (may still) a plant at Monterey and Blossom Hill. Thanks for writing your experiences. I would love to have some schooling from Patrice on pad polishing. Thank you for all those detailed post on the class. It is always interesting to us to find out what the student get out of the weeks they spend here. I can tell you that you are frankly hard on yourself. Even if you do not see it that way, you did a great job. Breaking pieces happened all the time to everyone. It is also the best thing that can happened in class as it gives us the opportunity to show you how to do repairs. Following the line comes with practice, it’s a bit like learning how to drive with a manual car, there is to many things to do at first to be a great driver, then when you are comfortable with the tool, you will cruise. We will be following your blog with great interest! I probably am too hard on myself. It didn’t help that I was getting calls from work all week either. I’m eager to get my Chevalet built and see if I can do a better job with a little more practice. I’m going to re-do the coasters as the first project I think, and see if I can get the curves to be more consistent and graceful. Marquetry aside, that whole “relaxing” thing is a struggle for me. I think once I get my chevalet finished I’ll be able to spend some time practicing and get in the groove. I really appreciate the class and the opportunity to learn from you and Patrick.